Your wicker patio furniture is an investment as well as a decorative asset to your patio that you need to care for. 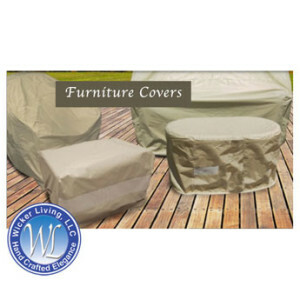 Protect your investment and decor by using wicker furniture covers that will ensure that the furniture frames and cushions retain their appeal and appearance for a long time in addition to extending their useful life. Patio furniture whether it be wicker furniture or some other kind of furniture begins to age after it is manufactured. At some point of time in the future without some care, that furniture will become deteriorated and ready for the scrap pile. Recognizing that nothing is cheap today and will only cost more to replace in the future, it only makes sense to take a little care in order to protect your investment over the short and long term. You may wonder why it is suggested that you cover your furniture during periods of infrequent use since after all, it is outdoor furniture. The answer is simple. If you don’t take some care of your furniture against the things that can eventually deteriorate it, then it won’t last as long and it won’t look as good as compared to if you do nothing at all. Decomposition of resin that is reinforced with ultra violet light inhibitors is small for quality resin and high for inferior resin. Simply letting your furniture sit out in the elements for months and years all the time will eventually cause it to deteriorate faster than if they are covered or stored when not in use. Using wicker furniture covers or storing them out of the sunlight will help protect against discoloration and fading, nicking, scratches and aging due to ultraviolet light. How Long do You Expect to Use Your Patio Furniture? The simple answer to how long do you expect to use your patio furniture is, it all depends. If you are like most folks, you will want to keep your patio furniture for as long as you can. Outdoor Wicker furniture and many other types of outdoor furniture are purposely built for the outdoors and won’t show any signs of harm in the short term. What you might not realize is that, if you can keep the furniture from aging during times when you’er not using it much, then you can probably extend how long you keep the furniture in quality condition buy simply covering it with furniture covers to limit full exposure to the sun and other elements that can deteriorate your furniture slowly over time. Depending on the quality of the resin used, you can expect your wicker furniture to last anywhere between 2 and 8 years with full exposure to the sun and other outdoor elements before it begins to show serious signs of deterioration. By covering or storing your resign furniture when it’s not being used can as much as double its aesthetic and useful life. Do You Need To Protect Outdoor Furniture? Outdoor wicker furniture and other patio furniture can withstand the outdoor elements quite well, thats what they are designed to do. But they are designed to do it for a somewhat limited term exposure as compared to being left outside 24 hours a day seven days a week for ten years. We fully expect most quality brands of outdoor wicker furniture to last for many years without deteriorating to the extent that they become unsightly and not usable. Unfortunately, there are some lesser desirable grades of resin furniture that just won’t hold up because the resin itself is not quality. These poor quality resins will fade and crack much sooner than a quality resin. However, depending on the type of resin that is used and cushion material you buy, you can experience different deterioration rates. The reason is that not all resins and not all cushion materials are the same. Some resins and cushion fabrics hold up better in the ultra violet sunlight than others. Dirt, branches and leaves left on the furniture can stain, scratch or dirty the furniture finish or cushion fabric. So, to combat the small daily effects that build up over years, you do need to protect your outdoor furniture if you want it to last longer.